A man and woman where on their honeymoon after a long and very happy courtship. On their honeymoon, they decide to take their horses through the beautiful mountain passes of Europe. As the horses were crossing a small stream, the woman's horse mis-steps and jostles the man's wife. Once across the stream, the man dismounts, walks over to the horse, and stares into its eyes. Finally, he states, "That's one." The man remounts his horse and they continue their ride. A bit further down the path, the woman's horse stumbles when stepping over a fallen tree. The man dismounts, stares the horse in the eyes, and boldly states, "That's two!" He returns to his saddle and they move on. As the afternoon sun began to set, the woman's horse once again lost its footing on a mossy slope. 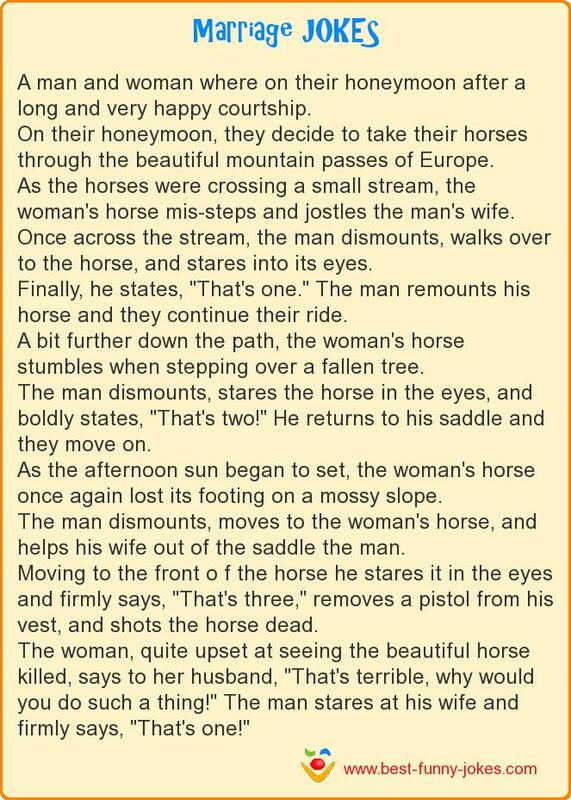 The man dismounts, moves to the woman's horse, and helps his wife out of the saddle the man. Moving to the front o f the horse he stares it in the eyes and firmly says, "That's three," removes a pistol from his vest, and shots the horse dead. The woman, quite upset at seeing the beautiful horse killed, says to her husband, "That's terrible, why would you do such a thing!" The man stares at his wife and firmly says, "That's one!"